The Immersion classes are taught by 2 teachers. One is a Native English speaker and the other is a Japanese teacher. 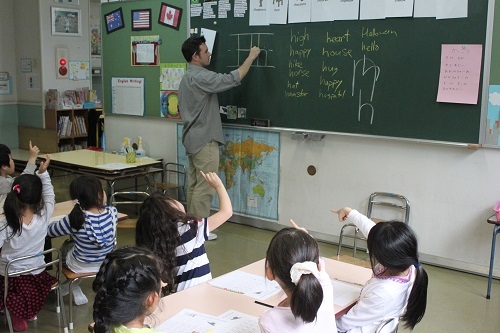 The Japanese teacher develops the base plan for the class and they then work together to develop fun and meaningful lessons and activities done all in English. Not only speaking, but reading through phonics and writing is also practiced. Class 1 is the first time for many of the children to be in a full immersion class. 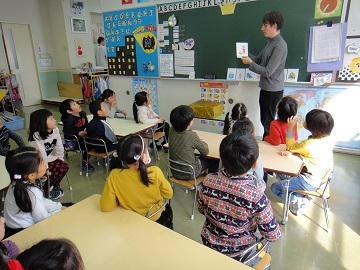 Children are gently introduced to an all English environment through English games and activities. The aim is to make children feel comfortable with both hearing and speaking English. When children enter Class 4 they are confident and comfortable with the immersion environment. From this base the children are taught lots more English and numerous other activities. There is lots of learning and lots of fun. The children really develop here. By Class 7 the English level is high. Children learn more complex English targets and are able to understand English spoken at a natural pace. 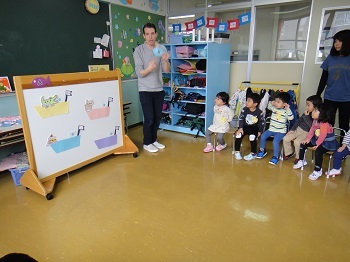 Children get a full schedule each day, from art and craft to English and Japanese. Children learn about the world and are prepared for life in elementary school. An important part of English learning are phonics activities. Here at IYK we pride ourselves on a quality, fun and meaningful phonics program. Starting from basic sounds in junior classes leading to reading and writing in senior classes. During the school year we have several switch days. The native English speaking teachers switch classes for the day. This is a great opportunity for children to be exposed to English from different countries. These days are always popular with the children. In immersion classes almost all the daily activities are taught in English. Each grade has one immersion class. 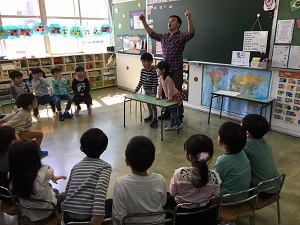 Classes are led by an overseas native English speaking teacher and supported by a professional Japanese kindergarten teacher. Conducting the school day in English enables children to acquire English expressions needed for natural communication. Beyond class activities there are many more chances for children to be exposed to English with our team of seven native English speakers.